All traps must be hauled at least once every 30 days, or the gear is considered to be abandoned. It is unlawful to abandon gear in Massachusetts waters. If you believe your gear is lost and may become abandoned, please contact the Massachusetts Environmental Police or the Division of Marine Fisheries and inform them of when and where the gear was last hauled and set. 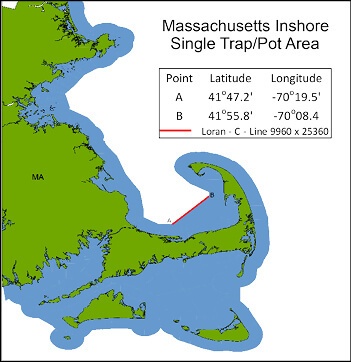 The use of single traps is prohibited in state-waters north of Cape Cod that are seaward of 3-miles from shore, with an exception for an area off Billingsgate Shoal. This area includes those waters that are shoreward of the Loran-C Line 9960-X-25360, as it runs from Barnstable to Wellfleet (see map for coordinates). All traps must be removed from and may not be set in the Large Whale Seasonal Trap Gear Closure Area from February 1 through April 30 (see map for coordinates). Single traps may be set in the shaded areas depicted in the map below. From February 1 – April 30, traps must be removed from and not be set in the area defined in the map below.